So I’m back in Medway. I need to keep busy, and there’s not a great deal of stuff happens here (I mean there are fun things that go on, but they tend to be spaced out a bit). Me & Tukru decided to start some things up ourselves. The devil makes work for idle hands. Here’s one thing we’re doing. It turned out to be surprisingly easy to set up. A monthly club night with an all-female playlist. 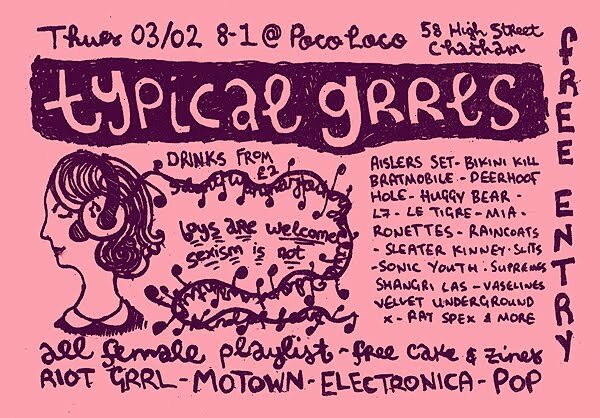 Riot grrl, motown, electronica and pop. Free zine and cake on entry. Free entry. Oh we’re good to you, and you know it. Here’s the crudely risographed flyer I knocked up on the train yesterday. If you’re in Medway come and abuse our hospitality. Thursday 3rd of Feb 8-1 at Poco Loco. Drinks from £2. Check out the Facebook event. And the tumblr for the clubnight.